These three districts in the centre of Shetland have a great variety of scenery and wildlife, from mountain hares and golden plovers on the high moorland to seals and otters along the sheltered rocky shores. 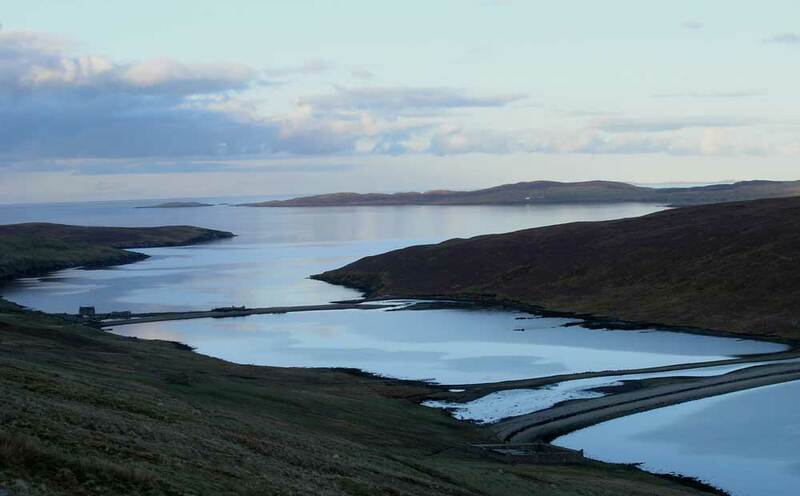 Bold headlands and off-lying islets contrast with the superb hummocky peninsulas of North and South Nesting and the dramatic fjord-like landscape of Dales Voe. Just a few miles to the north, one of Europe's largest oil and gas terminals is tucked into the shore-side landscape of Sullom Voe. Every week, millions of barrels of oil from the Brent and Ninian fields are pumped into massive oil tankers bound for refineries world wide and yet, within a few minutes drive from the terminal, you can stand in a secluded valley with an unpolluted pebble beach and trout stream all to yourself. Public Telephones: South Nesting, North Nesting, Vidlin, Laxo, Voe, Brae, Mossbank, Toft. Churches: South Nesting, North Nesting, Vidlin, Lunna, Voe, Brae, Mossbank, Muckle Roe, Gonforth.